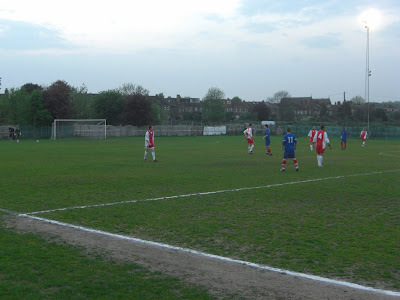 My twenty-eighth stadium of 2011 was on Wednesday 20th April 2011 at Grand Drive in Raynes Park, London. The match was Raynes Park Vale vs. Wembley in the Cherry Red Records Combined Counties League Premier Division. Grand Drive is situated inside Prince George's Fields around half a mile from Raynes Park railway station in South London. The signage on the main road still suggests the ground is occupied by Malden Vale FC who merged with Raynes Park FC to create Raynes Park Vale FC back in 1995. The main sign at the complex entrance is at least up to date although nowadays looking in a very sorry state. The entrance to the actual ground was not easy to find as you have to walk along a pathway round the back of the complex before coming across the access point. With this not being opened until just before kick-off several people were, like myself, milling around looking for how to get in. Once inside it was readily apparent that this was a venue that had seen better days. The club have been looking to move to a new ground for several years and I can see why. The whole thing is surrounded by green wire mesh in order to separate it from the rest of Prince George's Fields, but with these not being particularly tall, any shot that went over the bar was likely to leave the stadium. The ground had one seated area, a worn-out looking stand which was actually a fairly comfortable place to watch from. Behind one of the goals was a tiny terraced section which just consisted of a couple of raised steps with a roof although I didn't see fans using this as with it being a warm evening they seemed content to stand out in the open right next to the pitch. The game was simply awful. Wembley edged things in a fairly dull first period but were unable to break the deadlock. Raynes Park Vale started brightly in the second half and had two good opportunities to score but their woeful finishing let them down. The game was summed up when one of their players was clean through on goal and contrived to shoot the ball into a tree. After this the game somehow got progressively worse with hopeless passing, petty fouls and both teams pointlessly claiming handball any time the ball got above waist level. Eventually it got rather tetchy resulting in Wembley being reduced to ten men. 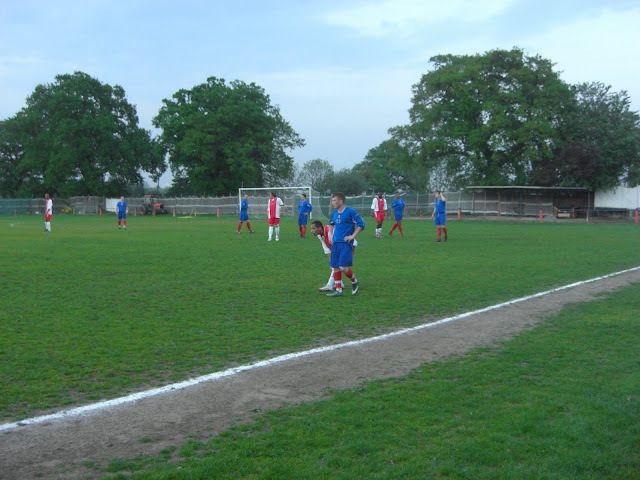 Shortly after this the full-time whistle went with the two sides sharing a point for a goalless draw.